To get you in the mood for this post, here is a link to our walking soundtrack featuring Patsy Cline Let it play in the background as you read on. When was the last time you experienced an unexpected perfect moment? 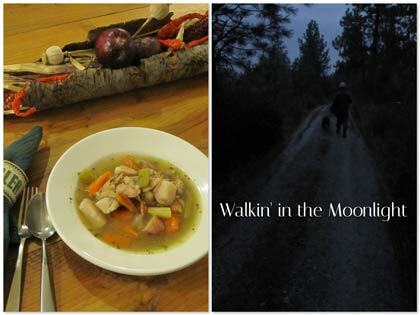 Last Saturday night after a light dinner of turkey soup with fresh buttermilk biscuits, our belly’s were full, the moon was bright, calling us outside for an evening stroll. Moments like these wake us up, they are not part of the plan for the day, (or evening) they are the simple pleasures that make up a full life.